Time to celebrate raspberries. 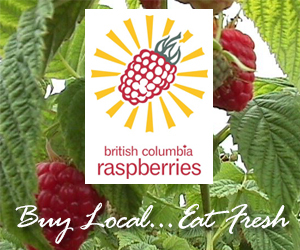 BC Farm Fresh hopes that you’ve been enjoying this year’s great raspberries. Sweet, tasty, and good for you! Here are some raspberry fun facts to keep in mind as your enjoy these great berries. 1.There are over 200 different known species of raspberries but only 2 species are grown on a large scale. 2.Raspberries are an aggregate fruit. Each raspberry is a fruit cluster with many bead-like fruits called druplets clustered around a core or receptacle. Each druplet contains one seed and a well-developed berry generally has 100 to 120 seeds. 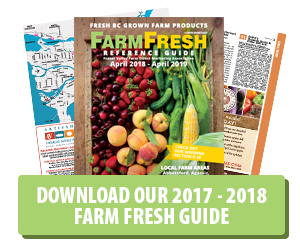 3.Raspberries are an important crop for BC farmers – we grow 90% of all raspberries sold in Canada. In fact, Abbotsford is known as the raspberry capital of Canada. 4.Their Latin name is Rubus idaeus. They actually belong to the rose family along with strawberries and blackberries. 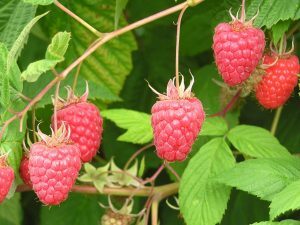 5.The root system of raspberries is perennial, but each shoot is biennial, and survives for 2 years, (producing the fruit in the second year). 1.Raspberries are most likely native to Asia, wild raspberries have been eaten since prehistoric times. 2.There’s a myth that raspberries used to be only white in colour. One day, a nymph named Ida was taking care of an infant Zeus. Zeus was crying and to help soothe him, Ida picked some white raspberries. But when she went to pick the raspberries, she scratched herself on a thorn and started to bleed. Her blood dripped on the white raspberries, instantly turning them red and they have been red ever since. 3.The people of Troy, in modern-day Turkey, were the first to note an appreciation of the raspberry fruit. 4.4 A.D. saw the first writings on the cultivation of raspberries. 5.Cultivation began in England and France, probably in the 1600s. 1.100 g berries hold just 52 calories but provide 6.5 g of fiber (16% of daily recommended intake). 2.They do not have any fat, saturated fat, sodium or cholesterol. 3.Fresh raspberries are an excellent sources of vitamin-C, which is also a powerful natural antioxidant. 100 g berries provide 26.2 mg or about 47% of DRI of vitamin C.
4.Raspberry contains anti-oxidant vitamins like vitamin A, and vitamin E.
5.Here’s a mouthful – raspberries have significantly high levels of phenolic flavonoid phytochemicals such as anthocyanins, ellagic acid (tannin), quercetin, gallic acid, cyanidins, pelargonidins, catechins, kaempferol and salicylic acid. Scientific studies show that the antioxidant compounds in these berries play potential role against cancer, aging, inflammation, and neuro-degenerative diseases. 1.They can be made into sauces (for poultry or desserts), jams or jellies. 2.They can be eaten fresh, either plain or on top of food choices such as yogurt, ice cream, cereal or salads. How about with whipping cream? 3.They can be baked in pies, cakes, breads or muffins. 4.They can be in drinks, such as smoothies or punches. After reading all this, I’m sure that you agree that annual Golden Raspberry Awards that recognize the worst in film industry does a great disservice to a wonderful berry.